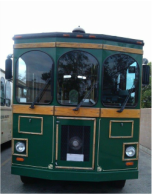 By Becky Jacobs on Nov 3, 2015 at 6:18 p.m.
A trolley will be rolling into the Grand Forks Town Square Farmers Market. purchase a "Molly Trolley," a mobile food and education trolley. "We've had a great response from the community, and I think it will add something to the market itself," said Molly Soeby, a North Dakota State University extension parent educator and agent for Grand Forks County. The trolley will be owned by the farmers market, but it will be used for other events, Soeby said. While the trolley will be at the market every Saturday during the farmers market season, it will also be used for agritourism and education programs in Grand Forks. Soeby also said the Grand Forks Housing Authority has expressed interest, and the trolley will be able to reach elderly, low-income and disabled people who may have trouble leaving their homes to get fresh food. Soeby said the trolley could be used during the winter, possibly by renting it out for other programs, when the farmers market is not in season.